Nov - 10 | By: Oregon Film | one comment. Earlier this year KAOH‘s Doug Kenck-Crispen came to us and said “we need to do something on ‘Paint Your Wagon’,” and we said “heck ya, Pardner!” Then, in August and October we made separate trips out over rough roads into the wilds of the Eagle Cap Wilderness to find what remains of the shooting location for the 1968 production which built not one but two No Name cities. KAOH went even deeper, camping on site, digging into the location remnants, the people, the history, the stories and the amazing scenery about 30 miles outside of Baker City and the result is this podcast and the upcoming screening of “Paint Your Wagon” at the Hollywood Theatre on November 16 with all proceeds going to the Baker Heritage Museum who have a great PYW exhibit all of their own in Baker City. 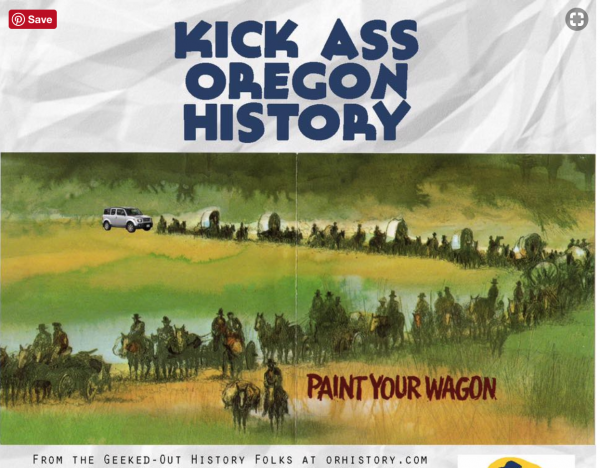 Legend has it that Oregon Film was formed by Gov. McCall (with the help of Warren Merrill) around the needs and aspirations of PYW, and so we’ll be celebrating our own 50th anniversary next year as well. We thank our partners at KAOH, The Hollywood Theatre and the Baker Heritage Museum for helping us kick off our 50th and we hope you not only get some fascinating insights from KAOH but also join us at The Hollywood on the 16th where you’ll have a chance to win a Weekend in Baker City courtesy of our partners there: Blue Door Inn, Sweet Wife Baking, Lone Pine Cafe, Bella and the We Like ’em Short Film Festival. If you’ve been to Baker City, you’ll know why we’re excited about this prize, but, if you haven’t, this may be just the excuse to go there.